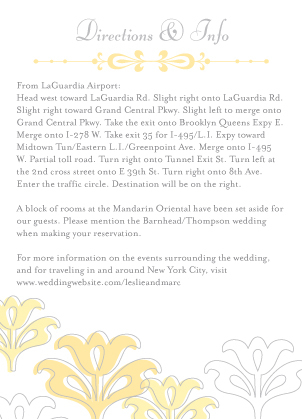 Including wedding direction cards in your custom wedding invitations is a helpful touch. 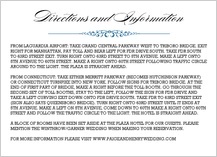 Wedding direction cards are especially handy for guests attending your wedding from out-of-town, helping to ease the stress of finding their way to unfamiliar locations. Inside your unique wedding invitations, there should be a direction card for getting to the wedding ceremony and to the reception or party afterwards. 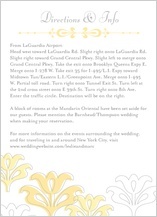 LookLoveSend understands your wedding direction cards should coordinate with your wedding invitation design. We make it easy with an extensive collection of designs to coordinate with the wedding stationery components you need. We will create your unique wedding invitation, wedding response cards, wedding reception cards, direction cards, wedding ceremony programs, and even your wedding thank you cards. Once you choose your unique wedding invitation design, select a color palette and font style, and with a few clicks of the mouse, LookLoveSend allows you to personalize your wedding direction cards. LookLoveSend printers can either print your directions as text or as a map. You can hand-draw the map yourself, or include a map provided by your reception or wedding venue. LookLoveSend can also turn your direction cards into day-of-the-event cards or any other format you desire. Our expert printers will adjust your chosen text to fit on the card or paper of your choice. LookLoveSend will ensure your direction cards are easy-to-read and follow. We promise to work with you so that you are 100 percent satisfied with your wedding direction cards. We won't print until you approve a digital sample of your direction cards, and our in-house designers will work with you to make changes you request. LookLoveSend always prints on our high-quality paper and card stock. We always guarantee top-notch quality printing for an affordable price. Our sophisticated, stylish designs are sure to enhance your wedding invitations and impress your guests. 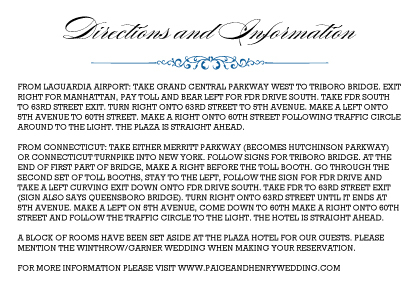 You will love our attention to detail, and your guests will love their easy-to-read wedding direction cards.